In the not-too-distant future, the world changes because of a virus. Those most affected with Haden’s Syndrome become “locked in” to their own bodies, unable to move or physically react to any stimulus. Sufferers contribute to society via the use of threeps, android-like models that offer mobility and interaction with the rest of the population. They can even hold jobs, and Chris Shane is starting his first week as an FBI agent. 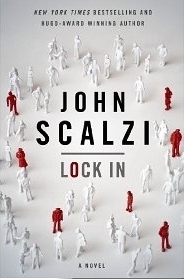 Lock In by John Scalzi is witty science fiction in the guise of corporate thriller. As Shane and his partner puzzle out a series of seemingly politically motivated deaths, they are faced with both the intriguing possibilities and the unthinkable dangers of this brave new world.